"Today" show host Savannah Guthrie didn't mince words Wednesday when challenging House Speaker Paul Ryan's arguments that the GOP tax bill would spur enough economic growth to make up for an explosion in the deficit. Guthrie told Ryan that many CEOs have said they won't use the money they save in tax cuts to reinvest in their businesses, create jobs, and raise worker wages, as the GOP has argued. Instead, they'll "do stock buy backs" and "line the pockets of shareholders," she said during the Wednesday morning interview. Guthrie quoted billionaire businessman and former New York City mayor Michael Bloomberg, who has argued "it's pure fantasy to think that the tax bill will lead to significantly higher wages and growth." She then posed the question to Ryan: "Are you living in a fantasy world?" 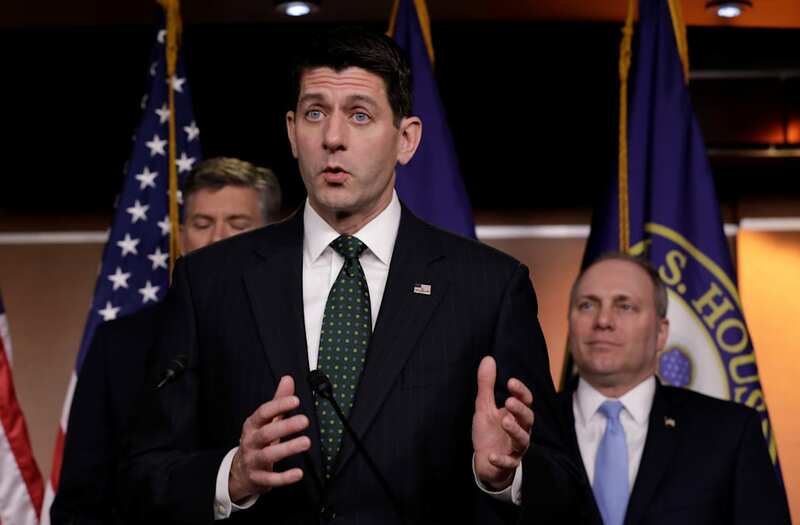 Ryan, who has long advocated for deep tax and spending cuts, responded by citing surveys of business owners, the vast majority of whom he argued would do "just what we say: reinvest in their workers, reinvest in their factories, pay people more money, higher wages." Ryan argued that the "data is really clear." He said "it's not a question of if, it's a question of how much" workers will benefit from the bill's dramatic corporate tax cuts. Guthrie moved next to a clip of Gary Cohn, the National Economic Council director and former Goldman Sachs executive, and a room full of CEOs who were asked whether they'd increase investments in their businesses as a result of the GOP tax cuts. Just a smattering of the CEOs hands went up, leaving Cohn awkwardly asking, "Why aren't the other hands up?" "The fact is, corporations are already sitting on a ton of cash, they have record profits," Guthrie told Ryan. "Why aren't they raising wages and creating jobs now?" Ryan responded that much of this cash is currently "trapped overseas and cannot come back into our economy to be reinvested because of our tax laws." "We know that if we fix these tax laws we will get reinvestment back in this economy," he said. "Every study under the sun shows us, you lower the tax rates, make us more competitive, you will see faster economic growth in America." Guthrie brought up the national deficit, challenging Ryan, a longtime deficit hawk, to defend the nearly $1.5 trillion the GOP tax cuts would add to the deficit over the next decade. But when Guthrie asked whether the economic growth the GOP argues will be created by tax cuts will make up for the loss in the government's tax revenue, Ryan said that was impossible to predict. "Nobody knows the answer to that question because that's in the future," Ryan said, "but what we do know is that this will increase economic growth." Democrats and other critics of the tax bill argue that Republicans are grossly overstating both the potential economic boost from the tax cuts and the increases in investment by businesses. All independent analyses have estimated that the final version of the bill will add $448 billion to over $1 trillion to the federal deficit over 10 years, rejecting GOP claims that the legislation would pay for itself.